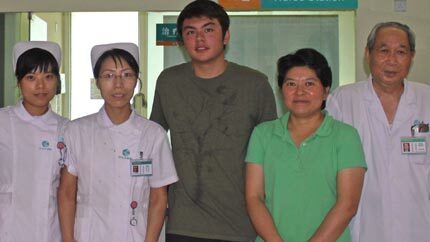 NSLI-Y Summer 2011 participant Erik with Chinese hospital staff who cared for him during his stay. While studying Chinese in Beijing and Shanghai with the NSLI-Y program, Erik never expected that his stay in a local hospital would inspire him to write and illustrate a children's book. Written in English and Chinese "Journey to the Doctors" talks about his experience and is being used in elementary school classes in his home school district in California. "All of the nurses took really good care of me," says Jensen on his experience in a Chinese hospital while being treated for a minor illness. "I had 11 nurses and 4 doctors come and see me throughout my stay at the hospital. A few language obstacles came up, but my teacher and I went over some hospital terms I hadn't learned before, so the obstacles were not bad enough that we couldn't communicate." Erik also credits his NSLI-Y experience with improving his speaking and listening skills, which he says have been the most difficult part of learning Chinese. "I learned common phrases and words that Chinese use. Many of these were different from what the textbook taught us. In China, I was able to learn some slang. I used a lot of words that I had learned in China to help write my book. My listening and speaking also improved greatly from this trip." Erik believes learning Chinese will be crucial to his career goals and plans to continue to study Chinese in college. "Knowing Chinese will help me not only study abroad, but also get jobs overseas in the future when I plan to work in international business." Erik had many amazing experiences on his trip abroad but says his visit to the Gobi Desert was the most worthwhile. "The group all rode camels in the Gobi Desert, and then we climbed to the top of a sand dune and were able to watch the sunrise from the top of the dune. Another experience that left a huge impression on me was just the experience of visiting China itself. Just being able to see and experience the whole culture left me speechless. Once I got home to America, I started noticing all the differences and similarities with China. I compared everything with an experience I had in China."